Monstress #18 is the crashing finale to this Eisner-nominated comic's third arc. 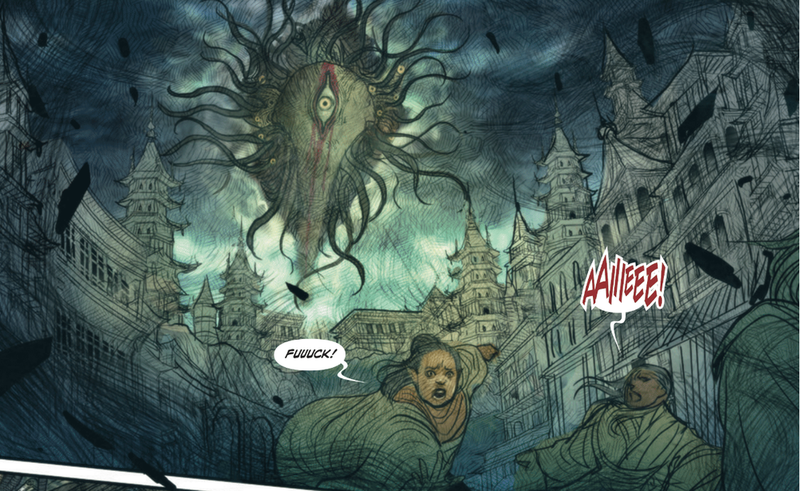 By Zack Quaintance — I’ve been reading Monstress issue-to-issue from its start, enthralled by writer Marjorie Liu’s depth of vision as well as the unparalleled artwork produced by Sana Takeda, as lush as it is detailed. The book blends anime stylizations, fantasy novel trappings, and hints of Eastern mythology, creating a unique reading experience. It also seamlessly alternates from subtle issues that explore its world and strengthen the bonds between characters, to issues that serve as high stakes crescendos. Monstress #18 is decidedly of the latter category, ranking as the most consequential action-heavy issue since the series’ searing debut, which was a statement about the marginalized striking back against abuse. Reading this issue, it struck me that our protagonist Maika’s being part of an oppressed group is an idea that has faded a bit in favor of her own personal hero’s journey, of her growing into an almost mythical savoir from a powerful line. It’s a transition that has given her more agency than she had at the start. Maika was threatened in early issues by horsemen and soldiers. By comparison, she has now become the living world’s lone defender against a threat that could end it. Maika’s development feels patient, too, a reward to long-time readers that makes her heroism in this issue all the more impactful. And this is just the first panel. In the end, we are left with a sense that the threats and bad actors in our story are not quite what they seem, and while this could feel unwieldy—if every development is OMG SO HUGE AND WOW!, no developments are OMG SO HUGE AND WOW!—Liu simultaneously uses her supporting cast to remind us of the relatable stakes for our protagonist. It’s a wise choice, one that ultimately makes this one of my favorite issues of Monstress this arc. I’m tempted to call Monstress under-appreciated, although I’m not sure that’s right, as I often see it prominently displayed on end caps in independent bookstores alongside the likes of Saga, Ms. Marvel, and Ta-Nehisi Coates’ Black Panther. This comic has its readership, to be sure, and it is, perhaps, better-suited for trade, so dense is its plotting. I do, however, think there’s quite a bit to like for monthly readers who haven’t tried the book, all of whom are missing out on—at minimum—some of the industry’s best artwork. Lastly, it should be noted that there will soon be three Monstress trades available, and that there’s never been a better time for new readers to give it a shot. SPECIAL NOTE: For more thoughts about Monstress, see Top Comics of January 2018.